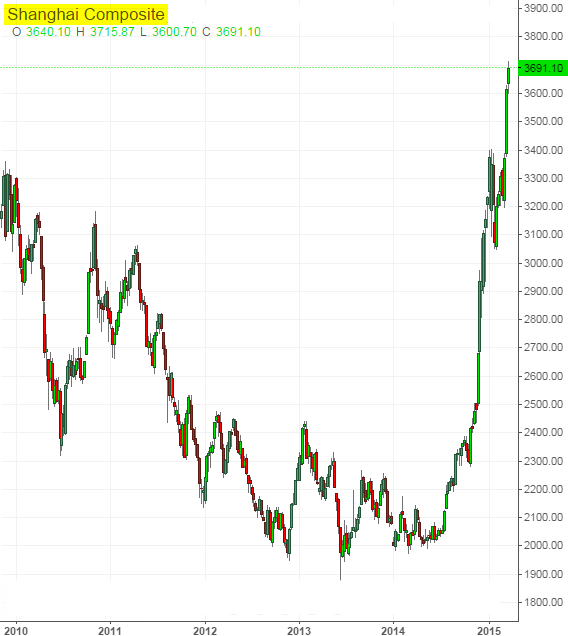 It's time to take another look at the recent developments in China's equity markets as major indices hover near the highs we haven't seen since 2008. With property markets in trouble, China's speculative investors are turning to equities. Moreover, increasing numbers of new investors are entering the markets. 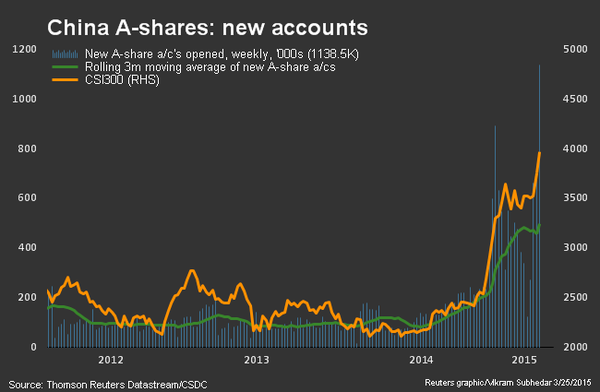 Last week we saw more than a million new A-share accounts opened, with brokerage firms having trouble keeping up. 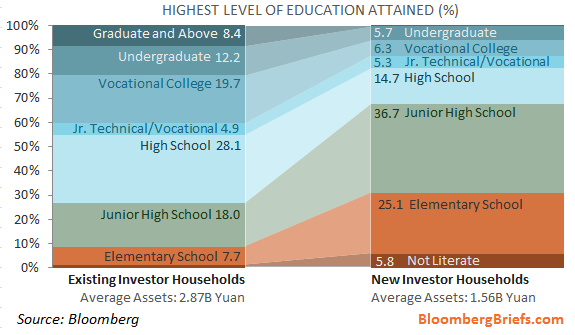 What's particularly alarming is that many new investors jumping into the market tend to be poor and far less educated. Everyone is all of a sudden an "expert" investor. Anecdotal evidence suggests that "hot" stock tips can be "obtained" from places like your local grocer and the barbershop. The most compelling evidence of speculative frenzy in these markets comes from the volume of stocks bought on margin. 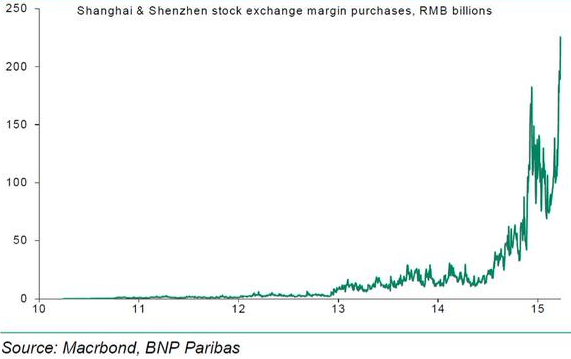 These developments certainly suggest that a bubble is building in these stock markets - similar to what we saw prior to the financial crisis in China. From the peak in 2007 it took the market about a year to give up 71%. Of course many argue that valuations are far better now and do not warrant such a correction. Perhaps. According to Patrick Chovanec, when it comes to valuations, there are some issues to consider. Valuations of course depend on the outlook for earnings (which could be tricky given the slowing economy) as well as the credibility of Chinese reported earnings. Chinese banks have low valuations simply because the quality of loan portfolios is expected to deteriorate. Some earnings reports are skewed by vendor financing which is not always properly disclosed. Yet other firms don't disclose their full liabilities, which are often off balance sheet in special-purpose vehicles. Many of these bets are based on new stimulus expectations from Beijing rather than valuations. The timing, scope, and effectiveness of such stimulus however remains uncertain. Whatever the case, given the sheer size of the potential new investor pool, this trend can go on for some time. However, Beijing is unlikely to passively watch these developments unfold. An additional regulatory action (and we already had one recently) could cause this market to take a material hit. China could put further limits on margin trading and add other restriction on trading activities. Moreover, such action could take place much sooner than many investors expect. We don't need extreme valuations to see a major correction.